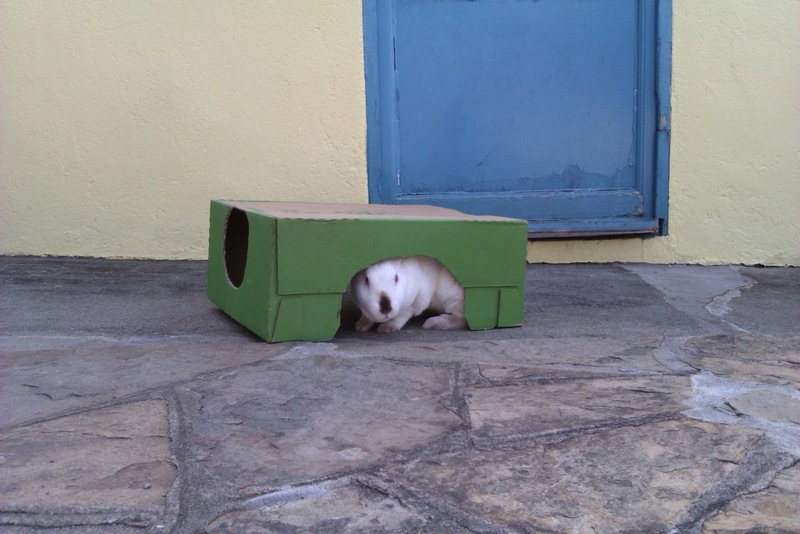 Speedy the cheeky house bunny: Speedy's great sleuthing adventure! This is me sleuthing at home! Mum and Dad has gone away on vacation leaving me at Grandma's(Mum's Mum)! what can I get up to?Grandma is always watching me so I don't do my little Houdini act.It is fun playing with Grandma and trying to booby trap her when she's doing things,but I miss my pals and it's difficult to use my laptop here with out being caught...you know what humans can be like with things like this and its better that they don't know how clever we bunns really are! Anyway one night this week I received an SOS from an anonymous source,something had happened to A Houseful of Rabbits!They had disappeared from blogosphere!The plea went out for Speedy the Super detective to investigate this disappearance.So I did some ground work on my laptop and found that someone or something had removed HOR this would never do!I tried several things to see if I could find out why HOR had been removed but nothing worked but I had come to the conclusion that it was a blip by Google or RG was doing some work on upgrading the blog but then I thought if that was the case I'm sure RG would have left a message of some sort.But its was getting late so I figured I would sleep on the problem. Early in the morning an Alarm came on making alsorts of noise waking me up with a start,I'd left my laptop on and an urgent message had come through from the same source my secret pen pal saying"SPEEDY SPEEDY WAKE UP!There's news at QI Papers! "so I said "Ok I'm a wake ,I'm heading over there now" so checking in with QI Papers a message had come in from BL and RG that Google had gone bonkers and removed them but every one was Ok!Thank goodness I was about to get in my magic closet that I had found at Grandma's the last time I was there and go and check in on Racer. I checked to see if HOR was back later that day but they were still missing.Hrmph! this is no good,Google is taking to long about this.Its time for some Bunny motivation,I'm off to pay them a visit and see if we can get this sorted out I thought.Taking a look to see where Grandma was hah she's gone up stairs this is my chance taking a big leap over the gate I snuck into the magic closet and thought I need the Tech geeks at google a few minutes later I found my self in a different closet and pushed open the door and took a sneak peak out of the door! I made it with that I hopped out and leaped on to the desk and started to thump very loudly with my foot. Everyone in the office turned in startled amazement as if they had never seen a rabbit before. "Which one of you Stoopid Hoomins removed A Houseful of Rabbits from Blogger? "I asked showing much anoyance and of course they all pointed at each other,So I THUMPED even more and said "Which one of you is going to fix it and put it back? "and they all looked at each other with blank face's and here's me muttering away this is what you get with working with Hoomins Hrmph! Any way after giving a big lecture on how it was very important that they got on top of the problem and put HOR back and giving the Tech Geeks some Bunny disaproval and my personal distain at their stoopidness and that they had 24hrs to get it back and working with no loss of posts Or I would be back with some pals they promised that they would fix it.with that I hopped of the desk and back into the closet and thought time to get back before Grandma misses me.I arrived back at Grandmas just in the nick of time as she opened the door there's me sat in the middle of the lounge floor looking all innocent...Hehehehe....little did she know what I had been upto when she scooped me up saying "Speedy you are a naughty bunny,you little escape artist!" And now I'm home with Mum and Dad as they are back from vacation and all is right with Blogger world! again for sharing the inside story O Champion of Truth, Justice and the Bunny Way. Tell me where I can send your sleuth gear! You are on, Little Buddy. It will be there when you need it. You certainly look chic in that green box. If I were you I might be tempted to hang that up nicely in my closet and save it for special occasions. Yeay to Speedy for fixing the problem speedily! Did you give your Grandma a kiss and a headbutt before going home with your parents? oh yes she was great fun! I always knew Rabbits secretly held the puppet strings of the world. No one would listen to me, and they locked me up in an asylum, which I am sure was haunted. I demand restitution for my false institutionalization! Oh, and glad you fixed the problem, Speedy. Stoopid googles. That was very impressive, not to mention speedy Speedy! Phew! Disaster averted. Thank you, Speedy! Speedy, I hope you are going put RG in his place. We can't have his kind of talk in the blogosphere. Maybe you should undo what you did? I leave this in your paws, but can you believe it?